The outbreak of war saw criminals exploiting the emergency conditions and those with a previously unblemished reputation tempted into crime. 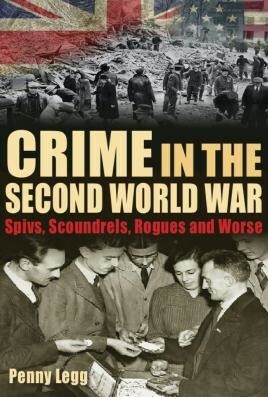 Penny Legg shows how and why crime was committed during the Second World War and what became of those Spivs, Scoundrels, Rogues and Worse who strayed into the underworld. Was There Crime in the Second World War? At a time of national emergency, the average person could be forgiven for thinking that crime rates would go down as everyone tried to help the war effort. However, the reality was that criminals saw the war as an opportunity to exploit the emergency conditions and those with a previously unblemished reputation found themselves tempted off the straight and narrow. Criminal activity wasn't just a civilian occupation. The military services had its share of crime and the influx of foreign troops added to the problem. American and Canadian troops found themselves transported to Britain in preparation for D-Day. Lonely and far from home, some rioted and many looked for other distractions with desertion being a significant problem and one which was often funded by crime. Heavily illustrated with both contemporary and modern photographs Penny takes you back to some of the most infamous wartime crimes such as the blackout ripper, the bath chair murderer and the last person to be prosecuted in Britain for witchcraft. She also delves into the murky world of Spivs, Gangs, prostitutes and Robbers. At a time when rationing, shortages and the blitz meant feeding the family became ever more difficult it was all too easy for the increasingly blurred line of criminality to be crossed. Penny Legg shows how and why crime was committed during the Second World War and what became of those Spivs, Scoundrels, Rogues and Worse who strayed into the underworld. Penny Legg, in her terrific book, shows that the truth was far, far removed from what we saw in Dad's Army…This book is a revelation, something of an eye-opener, and well worth a look.